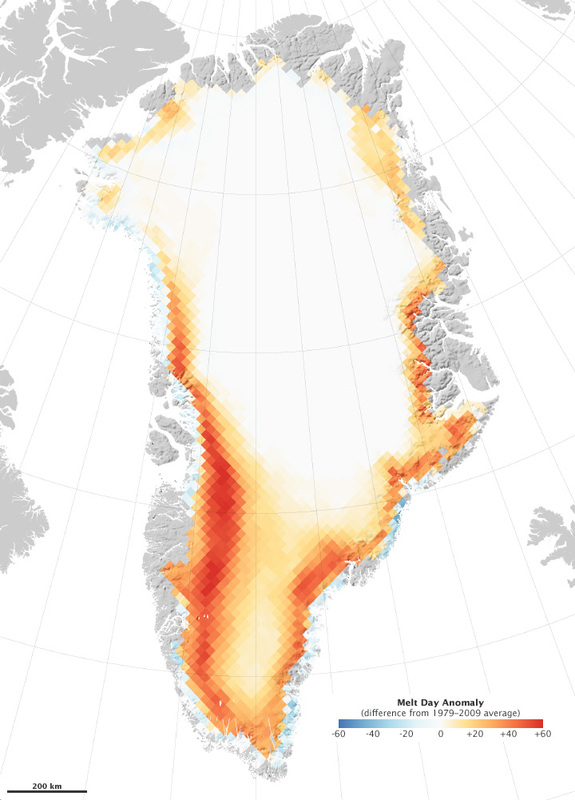 The long melt season primarily affected southern and western Greenland, where communities experienced their warmest year on record. After a warm, dry winter, temperatures were particularly high in the spring, getting the melt season off to a strong start. The early melting set the tone for the rest of the season, leading to more melting all the way into mid-September. To see how this melting looked on the surface of the ice sheet, see Tedesco’s photos and video on the City College of New York web site. NASA Earth Observatory image by Robert Simmon, based on data from Marco Tedesco, City College of New York. Caption by Holli Riebeek. 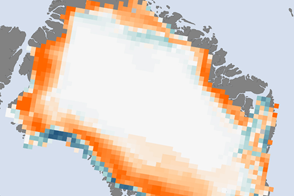 This image, made from microwave measurements, maps Greenland’s melt season in 2010, which lasted 50 days longer than average. IPCC. (2007). Climate Change 2007: Synthesis Report. Contribution of Working Groups I, II and III to the Fourth Assessment Report of the Intergovernmental Panel on Climate Change. [Core Writing Team, Pachauri, R.K and Reisinger, A. (eds.)]. IPCC, Geneva, Switzerland, 104 pp. Tedesco, M., Fettweis, X., van den Broeke, M.R., van de Wal, R.S.W., Smeets, C.J.P.P., van de Berg, W.J., Serreze, M.C., and Box, J.E. (2011, January 21). 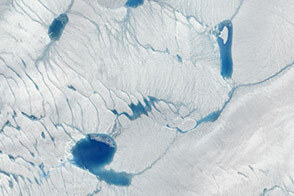 The role of albedo and accumulation in the 2010 melting record in Greenland. Environmental Research Letters, 6 (1).